Jess Breed and Laura Rogers, a lovely duo based out of Charlottesville, VA, captured our attention and our hearts through the lens of their gorgeous photography and hand dyed silks that feel like a second skin. Jess is best known for willow knows, her gorgeous custom silk pieces that are inspired by nature, from basics to bridal collections. Laura is a fine art photographer and fiber artist, gathering much of her inspiration from daily occurrences, her children, quiet moments, ever-changing landscapes, expressive style, and by living in the present. The beauty and passion that both of these women put into their individual craft is beyond amazing, but we admire the way that they so seamlessly collaborate on various pieces and projects that keep the eyes desperately desiring to see and know more. Their work / space in Charlottesville is home to their art, alongside several other local artisans, and also serves as a space for pop-ups, workshops, gallery shows, and other creative gatherings. 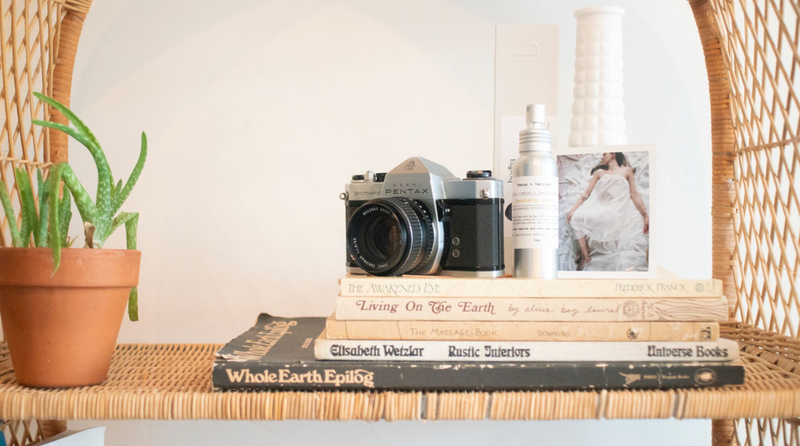 Jess and Laura have worked with us to help bridge the gap between Richmond and Charlottesville by providing a second home to Boketto skincare, home and pantry items in the company of other aesthetically pleasing pieces from fellow lady makers. This partnership is something that we're very fond of, as these women continue to inspire us to dream up unique offerings, gatherings, custom collaborative pieces and so much more. Join us through their journey, in their own words, of what inspires their craft and how it continues to evolve, how they manage to practice self care while raising sweet little ones, their favorite collaborations that they've worked on together, and of course, their favorite Boketto staples and moments. What is the inspiration and philosophy behind your work? JB: My most influential inspiration has always been nature and organic form. The way things naturally progress over time and the subtle and sometimes hidden patterns found in our natural world. I can remember being young and falling in love with the simple cracks in the sidewalk as I’d walk to school. I didn't realize what I was doing then, but looking back, I was able to take the time to rest for a moment with the delicacy of those natural patterns. This inspiration still holds true to my work today, as I am humbly looking to natural rhythms and forces that are beyond me to guide my own work. The philosophy behind my work is to stay true to my own vision, no matter the trends or outside influence. As my practice and life as an artist has evolved, I have come to be more dependent on visual objects and spaces as therapeutic means. Meaning, if an image or object I create brings me peace of mind, I will follow along that path. If I feel I’m doing something out of ego or out of an unauthentic reaction to something else, my inner voice will eventually alarm me. The promise I have made to myself (and to those who support my work) is to then stop and redirect my practice back to it’s true form of authenticity. LR: Capturing truth, discovery, rhythm, magic through images + textures. How has the vision of your work evolved over the years? JB: My vision for my brand and work has evolved in a lot of ways and continues to daily. A little over a year ago I felt the weight of my brand feeling too reactionary, meaning, I was not taking the time to design or create new pieces that felt true to my evolving vision. Instead, I felt I was being rushed to keep up with wholesale orders, market schedule, and the expectations of others. When I became pregnant, I took a much needed break from creating anything new. I knew that I wanted all of my focus on my growing baby, and knew that my brand and creative vision needed time to reset itself. My daughter is 10 months old and I feel I’m just coming out of my pregnancy and postpartum creative hibernation, and feeling the (focused) pull to make new work again. Taking a long break was not easy, as I found myself feeling very down at times when I was not able to focus long enough to put my creative energy towards something I felt proud of. I have learned so much about myself this past year and about the work I want to put out into the world, and I’m so looking forward to some new beginnings. Are there any custom pieces or collaborations that you've especially loved working on together? JB: Having a best friend and creative partner like Laura is one of my life’s greatest gifts! We keep each other inspired and always support each other’s new and wild ideas. We have a lot of ideas between the two of us, and finding the time and place over the years to work productively together has been integral to my creative spirit. If I had to pick one favorite project it would be the willow knows spring 2014 lookbook. The shoot came together so beautifully and the images we created during the shoot are still to this day everything I want willow knows to represent. LR: We’ve done so many beautiful photoshoots and styling projects it is hard to pinpoint a favorite! One that comes to mind is Jess’s spring 2014 willow knows lookbook/campaign - it was the most instinctual, harmonious shoot that we worked on together. With both of you being mamas, how has this new lifestyle shaped your personal approach to self-care and overall wellbeing? JB: My life has changed so tremendously since becoming a mama. I have to admit that I was not fully prepared for the shift, but now having experienced it, I don’t think anyone really could ever become fully prepared. Being a good mother is the ultimate sacrifice of selfishness. It has been a tough transition to give up so much of my creative time, which was the time I always had to come back to myself and clear my mind of outside noise. Creating art is integral to my wellbeing, and the absence of that took a toll on my self care over this past year. My appreciation for self care and wellbeing has never been greater. I have been reminded how necessary caring for oneself is, and how when that is out of alignment, nothing can flow freely. It is far from easy, but lately I am trying to make time to have at least a short moment each day for myself. That could be as simple as a hot shower, a few minutes alone with my work in the studio, or burning a stick of my favorite incense while I fold laundry without distraction. These little moments make all the difference in my energy levels and perspective these days. LR: Having a 3.5 + (almost!) 7 year old in tow full time has really taken a toll on my self care over the years, you don’t realize it until it is too late, which sadly has occurred a handful of times since becoming a mother. I’ve taken time this past year to really hone in and focus on what actually feels the most special and necessary for my own personal well-being. I take time + care to do my face masks and take vitamins before bed - mornings can be way too rushed some days! This summer I have been practicing Mysore yoga and trying to factor in the inherently learned schedule and teachings of this practice. Your top three Boketto staples? JB: Bodha Modern Wellness Incense - I love every scent as they are truly aromatherapy at it’s finest, Gua Sha with Cordial Organics CBD Facial Oil, Living Libations Oil Swish. LR: Living Libations Royal Rose + CoQ10 Serum, Apothecary Richmond Cleansing Facial Oil, Bodha Modern Wellness Incense (Ground) + if I can choose a fourth, all Vitruvi essential oils (especially Frankincense, Ylang Ylang and Bergamot). How do you visualize or describe your personal Boketto Moment? JB: My easy go-to answer to this was going to be something along the lines of working in my studio, on my yoga mat, or finding myself in some other form of solitude. That answer doesn’t actually feel correct, as solitude is not something I find often right now. Last week as I was thinking about this interview, I found myself in a true Boketto moment. My daughter in my arms letting the waves crash into us as she gleefully screamed “eeeee” over and over. The moment gave me some sort of clarity I had been searching to find in my new role as a mother and an artist, and how to combine the two without neglecting one more than the other. To hold my child close as the power of the ocean swirled madly around us, I was humbled by the gift that I had been given to be Story’s mom. And though my “normal” art practice and self care routines may at (most) times fall by the wayside, if I am patient and understanding towards myself (the ultimate form of self care), I can selflessly give my child my all just as our mother earth has given so selflessly to us. My work as an artist will ebb and flow, and that's alright. My inspiration for my work as an artist and as a mother can come full circle back to the natural rhythms of the earth, and maybe the two roles do not have to be separate, rather, one in the same, inspired and influenced by the other. I am grateful for finding that Boketto moment of calm in the pull of the ocean's tides. LR: On our mountaintop with an herbal tea in hand, incense burning outside, watching the kids play peacefully, listening to the hawks fly overhead - while my husband plays guitar.